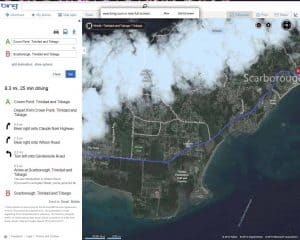 Microsoft’s Bing Maps of Trinidad and Tobago have improved a lot since we first looked at satellite imagery of Google Maps of Trinidad. 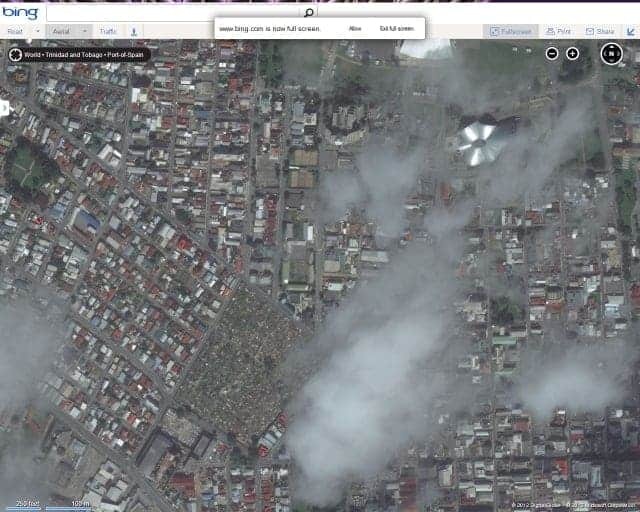 Here’s a satellite map of Port of Spain, Trinidad. Note the NAPA building indicating the satellite imagery is more recent than that of Google Maps. 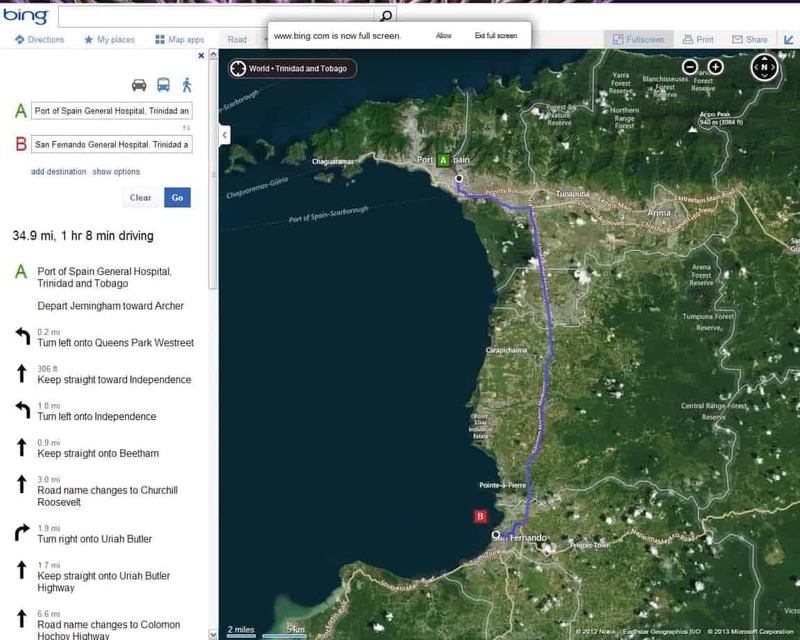 However, more interesting is an outcome of Microsoft partnering with Navteq – the ability of getting driving and walking directions to venues in Trinidad and Tobago. Its not 100% accurate, but impressive nevertheless. 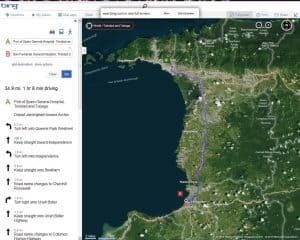 Here is a screenshot of Bing Maps showing driving directions from Port of Spain Hospital to San Fernando General Hospital. And here is a screenshot of Bing Maps showing driving directions from Crowne Point, Tobago to Scarborough, Tobago. TTCS Twitter feed at http://www.twitter.com/ttcs has been updated more regularly. Involved in ICANN’s (Internet Corporation for Assigned Names and Numbers (http://icann.org/)) policy work as the secretariat for the Latin American and Caribbean Regional At-Large Organisation (LACRALO ; http://lacralo.org/), a group of At-Large Structures (ALSes) within the Latin American and Caribbean Region. TTCS Software Freedom Day events for 2009 included 5 meetings including our first meeting in Tobago. See https://www.ttcs.tt/2009/12/29/software-freedom-day-2009-report/ for details including videos and pictures. just to name a few. Here’s to 2010! The Trinidad and Tobago Computer Society (TTCS) will be having a pizzalime on Wednesday May 13th, 2009 from 6pm at Pizza Hut, Roxy Roundabout. proposed Trinidad and Tobago Government Policy on Cinema Exhibition and Video Entertainment in Trinidad and Tobago. This policy is targeted “to the proprietors/ businessmen, administrators and law makers involved in providing availability to, and regulation of such availability of, film and video entertainment products to the public of Trinidad and Tobago.” and applicable “..to all persons exhibiting, intending to exhibit or otherwise making available motion pictures, video games or any form of video entertainment via rental, sale or arcades to the general public.” Read blog post for more details. and more. One attendee will receive a book about the popular Linux distro Ubuntu, along with the latest version of Ubuntu v9.04. Contribution of $30 towards food bill is expected. See you there! The Trinidad and Tobago Computer Society (TTCS) will be having a meeting on Saturday 21st March 2009 from 1pm at Engineering Consultants at 112A Edward Street, Port of Spain. Anyone interested in computing and future TTCS activities are welcome to attend. See you there! The CBS TV program 60 Minutes TV reports on the problem of electronic waste in the United States being illegally exported to places like Guiyu, a town in southern China. It is (or definitely will be) a problem in Trinidad and Tobago given our growing use of computers and cell phones. What happens to our e-waste in Trinidad and Tobago? Nintendo Wii Music for the Nintendo Wii will be available at Amazon.com on October 23rd, 2008. Available in Japan last month, part of the advertising was the variety of instruments available. The steelpan is also featured in the video trailer/ad for Wii Music on Amazon.com (1 minute and 5 seconds in). Nintendo has probably done more to popularise the steelpan, using it in Super Mario World (youtube video : 32 seconds in) for the Super Nintendo Entertainment System (SNES) in the early 1990’s.